Designed for travellers who like to see all the Main Elements of this Unexplored Country. Overnight stay at the Hotel in Yangon. Sightseeing Yangon, journey begins with walking downtown to explore the city centre and its fabulous mix of architecture and sites. The streets are filled with historical buildings many of which have a faded colonial charm not seen elsewhere in Asia. The journey being form Sule Pagoda with its golden chedi, which makes a useful landmark in downtown Yangon and impressive colonial style government buildings such as the City Hall, General Telegraph Office, the Supreme Court, High Court and many pastel- painted shops and apartments. Later visit to Bogyoke Market, (closed on Mondays), formerly known as Scott Market, a sprawling 75 year old shopping complex noted for its variety of handicrafts and other items which provide an excellent opportunity for a shopping spree. Afterwards, visit Chaukhtatgyi Reclining Image, Then, visit Kandawagyi Park, one of central Yangon’s greenest spots. Here you will see the glittering Karaweik barge, a replica of the royal barge, overlooking this scenic lake. Late this afternoon, visit Shwedagon Pagoda the most revered Buddhist temple in Myanmar. Although the origins of the pagoda are unclear, it is believed that the original structure was built in the 11th century then renovated several times until taking its current shape in the 15th century. The 8-sided central stupa is 90 meters tall and gilded with gold leaf and is surrounded by 64 smaller stupas and your guide will show you around the massive complex, explaining why this temple is so revered. Enjoy breathtaking views of the golden stupa and the city skyline from this vantage point. Breakfast at hotel and proceed to Kyaikhtiyo, (190 km, approx 4 hour). Upon arrival at Kim pun base camp board on an open truck for (15 km, approx 1 hours) steep but well-paved road leads to the upper staging point to the renowned Kyaikhtiyo Pagoda site 1180 meters above sea level. (Optional : you can alight from the truck at middle camp called Rathae Taung and walk up (approx 4 km : 45 mins) or as an easier alternative to walking, four porters at an extra cost can carry you in a sedan chair.) The Kyaikhtiyo Pagoda, 7.3 meters high, built on a gold-gilded boulder, 25 meters in circumference, and balanced in what appears to be a very precarious position on a tabular rock jutting out from a ridge in the Eastern Yoma Mountains. Kyaikhtiyo is likely to be one of Myanmar’s most spiritual experiences. (Note: Our given tour cost, is based on truck fare (from Kinpun camp near to the pagoda platform) sit together with locals, should you wish to have a seat at the front (or) wish to hire the whole truck for yourself, please check prices and pay extra directly at the truck station.). After breakfast, come down to Kinpun camp with truck. Your car will wait for you at Kinpun camp and continue the journey to ThaHton (approx 1hr 15 minutes drive). Then, continue toward Hpa-An direction. On the way you can visit Kawgun cave; that tells about Tha-Hton Kingdom which situated just before crossing the Thanlwin Bridge to HPa-An. This cave is adorned by millions of Buddha images and Buddha stories in stucco. Visit around the cave and continue crossing the Thanlwin Bridge and arrive to Hpa-An, the charming city is the capital of Kayin State. Then, visit to Kyaikalatt which is small rock hill formed like a wine glass. (Optional if time permits), continue to Mawlamyaing. Enroute visit to villages of Katoe and Kothnet which was a township; timber enterprises, flourished and well-developed in this region under the rule of British administration. Famous timber and steamship entrepreneur U Nar Aout donated and built the masterpiece monasteries, monuments and pagodas which are well preserved. They remind us of this ancient region which is full of traditional Mon houses and the objects historical interest. Visit around the monastery and villages and continue to Mawlamyaing. You have reached the city of Mon State “Mawlamyaing” once well known by Rudyard Kipplin’s poem and exporter of Teak wood to all over the world. Mawlamyaine is the third largest city in Myanmar which once was British Myanmar’s administrative center during the colonial days. Overnight Stay at the Hotel in Mawlamyaing. Visit to the local market of Mawlamyaing. Drive to Mudon the famous place of Mudon textile with visit to Kyauktalone and Winsein Tawya (a place for Buddhist devotees) and visit to Kyaik Mayaw, sitting Buddha famous for strange posture and return to Mawlamyaing. Mawlamyaing still has beautiful teak wood buildings & monasteries of Golden days. Evening visit to the city and teak wood monastery offered by Queen Sein Don of Mandalay and sunset view from Kyaikthanlan hill. After breakfast, depart Mawlamyine crossing over the through Thaton Mottama road. After breakfast transfer to Mandalay Airport to board flight for Heho. Upon arrival in Heho Airport you are met and transferred to your pre booked Hotel. Upon arrival in Heho Airport and transfer to Pindaya (approx 2 hour). Pindaya, situated at the foot of Mene-taung Range is a picturesque place, known, to the world as the home of the countless Buddha Images in its extensive lime stone caves and picturesque lake. Explore the wonder of cave and Pa O traditional paper umbrella making process and proceed to Kalaw (approx 1 hour). Cool, spring-like weather, pine forests, tea plantations and colorfully clad hill tribes make this town to a natural magnet. Overnight stay at the Hotel in Kalaw. Today, you will visit to one of the privately preserved retirement home of elephants which is 25 km from Kalaw. There, you can learn the lifestyle of Manut and their elephants, the surrounding forest and their floral and fauna etc. After breakfast visit Kalaw market day if it is coincide with the day of your visit. Overnight stay at the Hotel in Inle Lake. Full day sightseeing in Inle Lake. Traveling on the lake is an exhilarating experience for nature lovers and a chance to observe the unique traditions of the Intha people. Wonder unique leg rowing fishermen, floating firms, (built up from strips of water hyacinth and mud which anchored to the bottom with bamboo poles), houses and monasteries on the stilt etc. Visit Nampam market or any other market day which schedules on shore to be held here today. Continue visit floating village of Ywama, the lake’s downtown and largest village on the Inlay Lake, 11 century Phaungdaw Oo pagoda housing five sacred Buddha Images, the weaving village of Inpawkhon, famous for traditional silk-weaving, Se Gaung Village, famous for the blacksmith work and Nan Pan Village with cheroot making and boat-building dockyards etc and end your day with a visit famous Ngaphechaung, a museum like monastery where old belongings of many monasteries are restored. Breakfast at hotel and visit Indein Pagodas ruin complex (approx 45 minute), famous for its pagoda ruins which believed to be built in the 8th century. The market is of most attractive of its kind in the region and site is fantastic with rows of shops along the walk way. Return to Inle Lake and continue visit Myay Ni Gone Village for weaving of fabrics from lotus and finally Kay Lar Village to observe floating plantations etc. Mandalay is the last kingdom as well as the center of the Myanma cultural, tradition, arts and crafts has long been known as a centre of skilled craftsmanship and in former times supplied the royal courts. Afternoon visit traditional handicraft making process such as wood carving, tapestry weaving, gold leaf hammering etc further visit to foot of Mandalay hill to observe “the largest book” at Kuthodaw Pagoda where entire Buddhist canon have been recorded on stone tablets totaling 729 in number. Shwenandaw “Golden Palace Monastery” ex-palace complex of former Myanmar kings, to observe finest Myanmar wooden architecture. Sunset from Mandalay Hill with the view of dotted pagodas and Ayeyarwaddy River. Breakfast at hotel and visit Phayagyi to observe the most revered Mahamuni Image brought by Kind Bodawpaya in 1784 from Rakhine. The 4 meter seated Image was believed to have been casted in 1st century AD but over the year of offering gold leaf offering the figure is 15 cm thicket by gold. After a visit to stone carving, bronze casting and silk weaving process continue to ancient capital of Amapura “meaning city of immortality”. Visit Mahagandayon Monastery, home to several hundred of Buddhist novices and monks and observe the lunch process. Afterwards, visit to Ancient Capital of Ava. Ava is located on an island which can be reached by local ferry, crossing the Myitnge River. Pass through the ancient city walls by horse cart and see the remains of the ancient city: the brick and stucco monastery “Maha Aungmye Bonzan”, the renovated Nanmyin Watch Tower and the impressive wooden monastery of Bagaya Kyaung constructed with 267 teak pillars. Afternoon proceed to Sagaing, covered with 600 white-painted pagodas and monasteries, Sagaing hill is widely regarded as the religious centre of Myanmar and is home of 6000 monks and nun, 100 meditation centers. On your way visit traditional bronze casting, silver smith works which Sagaing is famous for. Sagaing become the capital of independence of Shan around 1315 after fall of Bagan. Visit Tilawkaguru cave temple filled with impressive mural painting date back from 1672, Umin Thounzeh cave temple with multitude of seated Buddha statues. Enjoy fantastic sunset view from the 200 year old U Bein teak bridge span across Thaungthaman Lake at the time when Amarapura was Royal capital. Return to Mandalay. This morning proceed to Mayan Chan jetty and board on a local fishermen boat for Mingun across Ayeyarwady river . Observe the world’s largest ringing bell casted by Bodawpaya in 1080 weighing 55555 viss which calculated equal to 90 tons and Mingun Pahtodawgyi, an enormous pile of bricks is all that remain of King Bodawpaya ambition to make it the world’s largest Buddhist stupa. After a visit of beautiful Mya Thein Tan Pagoda return to Mandalay. Afternoon free at leisure on your own. Today you are transferred to Mandalay Jetty to take cruise down to Bagan with R.V. Shwe Keinnery Cruise. Embarkation time is around 6:00 a.m. and departure time is 07:00 a.m. Cruise down all the day and arrive to Bagan Jetty in the later afternoon. The arrival time may be later in case the water level in the River is lower and the boat need to cruise slower. Overnight stay at the Hotel in Bagan. Bagan on the eastern banks of Ayeyarwaddy is home to the largest area of Buddhist temples, pagodas and stupas many dating to 11th and 12th centuries. Today visit around by Bagan’s traditional transport “Horsecarts “ from Nyaung U market, Shwezigone Pagoda, built by King Anawrahta but not completed until the reign of Kyansitthar. Kyansitthar U min, long dimly lit corridors decorated with frescoes (with torch lights), Htilominlo Temple, 150 ft high temple with fine plaster carvings, glazed sandstone decorations in the base, Payaagone and Taungbi villages. Afternoon visit, Ananda Temple; the most beautiful temple with 4 standing Buddhas in four cardinal points, history or lord Buddha and outside of the temple is decorated withTerra-Cotta worriers in green glaze plaques . Visit Lacquerware home industry and stroll around the village of Myinkaba, visit Manuha Temple; the temple of captive king of Tha-ton, and Pyattadagyi Temple for panoramic view of the city. Optional: This morning, riding Balloon over Bagan. Between 05:30 and 06:00 in the morning the bus from Balloon Flight Operator will pick you up from your hotel and send to the launch site. The exact time will be given to you the evening before for your Balloon flight. The Balloon flight will be 45 min to 1 hrs depend on the wind. You will be sending back to your hotel around 08:30 hrs after light breakfast. Morning visit to Southeast of Bagan: visit Minnanthu village, to see daily life style of Bagan people, take you along the path near Damayangyi, a massive-looking temple dating from 1170 that is famous for its interlocking mortarless brickwork. Next, visit Mingalazedi, the last of the large Pagodas built in the 13th Century, representing the pinnacle of Bamar pagoda architecture. 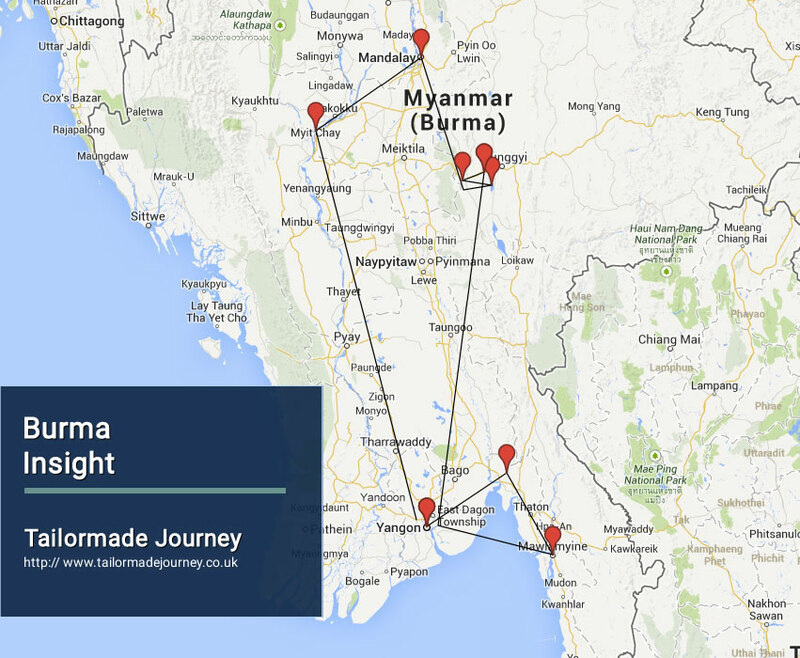 After today’s tour, board a local boat for a slow cruise down the Irrawaddy River. As you cruise the waters, observe the lifestyle of the fishermen and riverside villagers as well as enjoying the unique perspective of Bagan’s temples. Today you are transferred to Yangon International Airport to board Flight for Onward Journey . Construction of the hotel building itself began in 2004 on the new northern extension of Strand Rd (Kanna Lan) and was finally completed in late 2011. The hotel is the most luxurious hotel in Mawlamyine. The hotel is situated on the banks of the Thanlwin River with beautiful views of the sunset from its western entrance. The east end of The Strand is located on the busy Lower Main Rd about 200 meters from the Zeigyi, the central market of Mawlamyine. Facilities include satellite TV, hot and cold showers, air conditioning and wifi. Amara Mountain Resortfeatures well-decorated rooms with garden views. It boasts sauna and arestaurant. Free Wi-Fi is available throughout the resort. Amara MountainResort is a 10-minute ride from Bamboo Pagoda. Heho Airport is 40 km away.On-site parking is possible. Comfortable rooms here are provided with a seatingarea, an electric kettle and a telephone. An en suite bathroom comes withshower facilities and a hairdryer. For guests' convenience, the property offersa 24-hour front desk and a laundry service. Guests can enjoy a variety of European,Indian and authentic Burmese cuisine at the on-site restaurant. We are back from our tour of Sri Lanka and break in Dubai. We had a wonderful time in Sri Lanka and the whole tour went very well, all according to itinerary that you had arranged. Our sincere thanks also go to the driver/guide Mr Lal Mendes . He made the whole journey very memorable. Thanks again for arranging this holiday and we would definitely contact you for our next trip abroad and if we ever decide to return to Sri Lanka , a truly wonderful place.